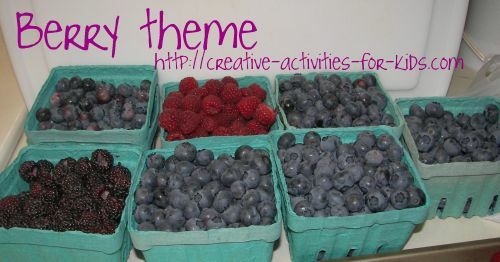 Kids will love a berry themed week, it is perfect in the summer when berries are plentiful! A wonderful way to start the week is to read the below mentioned books, they will have your child very excited to start this theme. A great way to get your berries is to look into local u-pick farms in your area. A great resource to find u-pick farms in your area can be found here. We have a great local strawberry/raspberry/blueberry u-pick farms, lots of great farmer's markets, plus we grow our own raspberries. We are lucky enough to have a huge patch of wild blackberries in our yard as well. If your family is berry crazy as ours is, it may be fun to plant some berries of your own. Berry Ink How fun would it be to write a letter to a friend, using homemade berry ink! Berry Dye You can use the berry dye to make unique berry dyed shirts, or play silks!